I came to England in the spring because it was supposed to be cool and pleasant. I brought long-sleeved shirts, a light sweater, and a blazer. I didn’t bring any walking shorts. I didn’t bring any t-shirts (except the underwear kind). I only brought a hat to keep off the rain, not the sun. I also came in the spring because photography under a clear blue sky is generally boring and harder to fill with visual interest, whereas cloudy (or even partly cloudy) days provide much more drama. So this whole “unseasonably warm” bit was making me cranky. And, since we were heading out for a day in the countryside, I was really wondering if I’d get any nice photos, or if I’d just burn off another layer of skin. We were going to Salisbury, which meant a train trip. This one would start from Waterloo Station, and we all know Waterloo Station, since several scenes from “The Bourne Ultimatum” were shot there. We found our train without incident, got on, and headed out. We got a good look at “The Glass Shard”—the mega-tower under construction that we’d seen from up on Primrose Hill—and dear lord is it going to be awful. If I had to describe what it’s going to be like, I’d say it was going to be like one of those “alien ships come to earth” movies, where you see a familiar cityscape (like, say, London) and then there, right over THERE, is this gargantuan alien-looking super-stylized (or semi-organic) mother-ship-type-thing which completely outsizes the surrounding buildings. That’s what this is going to be like. It doesn’t belong. It’s out of proportion, out of scale, out of synch with everything around it. It’s going to look like a 500’ tall crystalline blade has been thrown into the Earth’s crust from the heavens. We passed through small towns on our way, as per usual. It was mostly suburban (from the train) except for the town of Brookton, which seemed to be nothing but deer tracks and gravestones—one gets a skewed sense of these towns when viewing them solely from the railroad tracks—but by the time we reached Basingstoke it was much more pastureland and crops. Magpies flashed their black-and-whites as we passed; magpies always make me smile, they’re like blue jays but with serious attitude. Then came Overton, Whitchurch (pronounced Wheat-Church), Andover, Grateley, and finally, Salisbury. 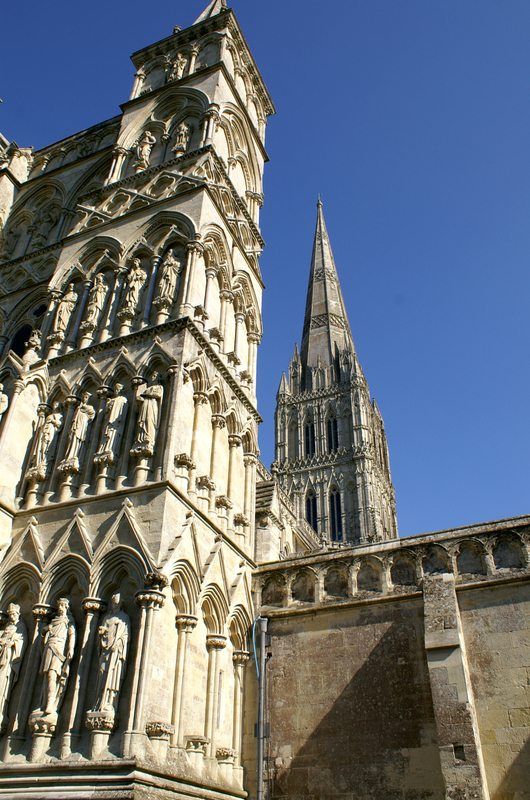 Salisbury is a nice town with a grand cathedral—the tallest medieval spire in the world, they’ll tell you (and then they’ll explain that, yes, the spire at Cologne is taller, but it wasn’t actually finished in the medieval period, and that there’s another that’s one’s taller, too, but it doesn’t count because of a foot fault made by one of the architects, or some such rubbish; in the end, it’s still a hell of a spire—which is visibly listing to starboard these days, because the foundation beneath it has giving way over the centuries, millimeter by millimeter, until now it’s a handful of feet out of plumb. They also have one of the four original copies of the Magna Carta, signed by King John, there in the chapter house, but we’d seen it all last trip, and we were only going back if time permitted. Today, we were in search of older game. From the railroad station we found the Salisbury/Stonehenge/Old Sarum hop-on-hop-off tour coach, paid our money, and clambered aboard. Most tour coaches have some boozy old guide who relates more stories about celebrities who live locally than about the sites you’ve come to visit, but this one had a pre-recorded narration that mixed modern and ancient history in an effective and informative way. 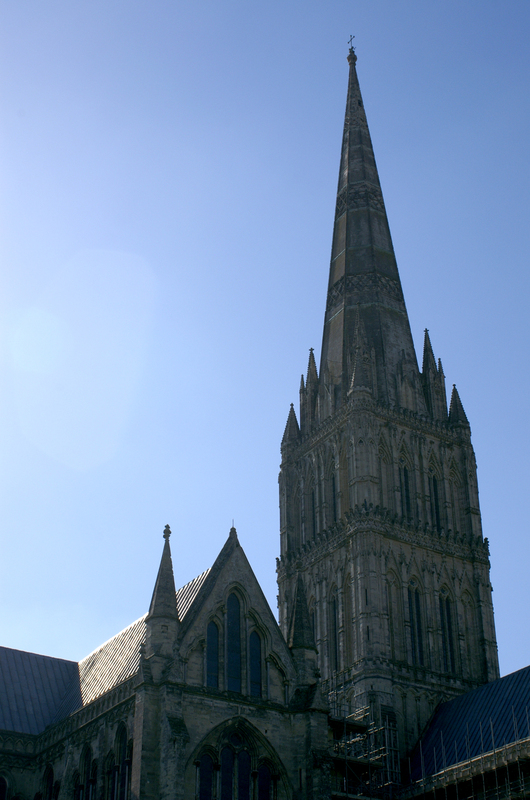 For instance, after learning that the spire at Salisbury is the tallest medieval spire in the world (see above), we then learned that it was never bombed during the Second World War, and the reason it emerged unscathed is that Hitler’s Luftwaffe pilots used the spire as a landmark (a “turn left at the spire” sort of thing). 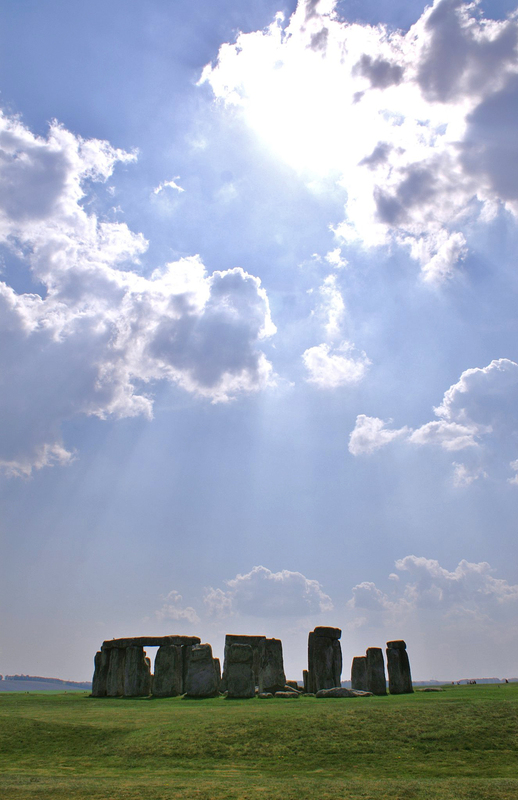 We “hopped off” at Stonehenge under hazy skies and began our self-guided tour. I wasn’t impressed with Stonehenge the first time we saw it—it was smaller than I expected, and being in a huge rush (we only had about 30 minutes there) didn’t help. This time, we were taking as much time as we wanted, and I got a better sense of its scale, walking slowly around it. Having time to listen to the audioguide helped, too, as it explained what we were seeing. There is no running water on the Salisbury Plain—a fact that you will hear repeated several times while visiting these ancient heritage sites—and knowing that, and looking around with that in mind, you really start to (a) marvel at the sheer engineering it took to quarry, move, shape, and erect these stones using Neolithic techniques, and (b) wonder at why the hell they put it here, of all places? It’s a spot that is both commanding and subtle, built on a rise that isn’t the tallest around, but is the tallest for a good ways, but the audioguide makes a point of the fact that in the times of its construction, the henges would have been surrounded by forest, making the view we have today irrelevant. Despite the growing heat, and despite the fact that you’re never closer than 50 feet to any of the stones (and usually more like 150’ away), I enjoyed this second, slower-paced visit much more than our first. I took shots from every angle, regardless of the poor lighting conditions. I was shadowing a trio of Japanese girls dressed incongruously in formal gowns and hair ribbons, who were walking the path and stopping every 10-15 yards to set up their tripod and take photos of themselves. We were also shadowing a young man who was sitting in front of us on the bus; I thought he might be Turkish, but wasn’t sure. People at Stonehenge tend to move slowly, as if perplexed by the stones before them. We moved slowly too, and as we moved around, the meteorological conditions changed: the haze burned off, the sun beat down, moisture rose, and clouds formed. By the time we’d completed our hour-long circuit, I got some nice shots. We hopped back on the coach. 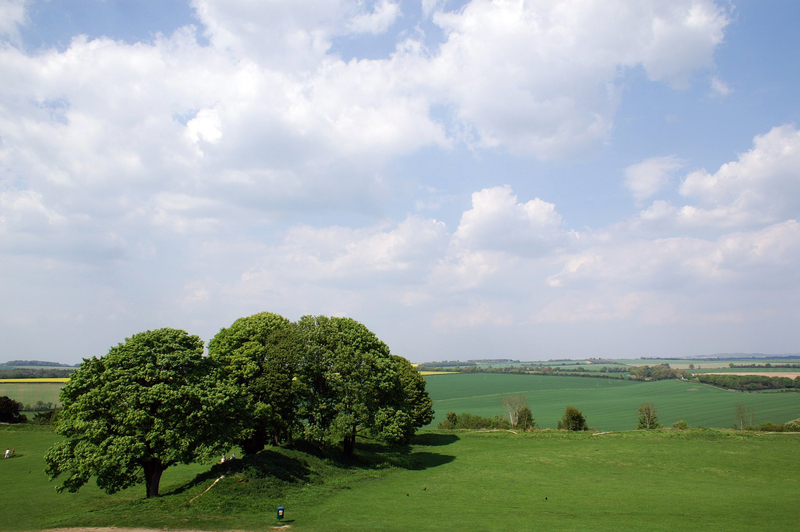 It took us around past Oxford Fields–an airfield proving grounds that was the site of the first air-casualty in Europe, during the First World War, as marked by a small marble cross at a traffic circle–and thence toward the hilltop castle of Old Sarum. Unfortunately, instead of driving us up to the site, the driver just stopped on the side of the road, dumped a bunch of us out on the curb, said ta-ta, and drove off. We looked around and didn’t see any large entrance, just a small sign on a gate across the road (no crosswalk, so watch out). We all turned on our bovine-brains at that point, and using our herd-mentality, crossed in a group to look at the only thing that looked at all promising. World Heritage sites are purposefully understated; they want to keep the sites as close to “as found” condition as possible. This, however, was going a bit far. What we found was a small piece of laminated paper with the words “Old Sarum World Heritage Site” and a directional arrow, pinned to a wooden gate. This led us down a path between sheep pasturage to another gate with a similar arrow. This led onward to a single-rut trail that wound upward along the hillside, and then split with one path going up a steep hill, and another going up a less-steep hill. Still in cow-mode, we blindly followed the young (possibly) Turkish man who naturally bounded up the steep path. At this point I became mindful of my responsibility as a husband. It was hot (upwards of 78°F), we weren’t in tip-top condition, and my wife had already had to take a hit on her asthma inhaler, so I didn’t want her trudging up some goat-track if it wasn’t necessary. I asked her to wait while I went instead to investigate the less-steep path. I soon spied another gate, another sign, and a paved road. Let the young Turk bound up hillsides, I’m taking our fifty-something frames up the easier road. The road led up through the car park to the entrance to Old Sarum, and with each step up the final slope, the wind increased about one MPH until when we got to the entrance, there was quite a breeze blowing. 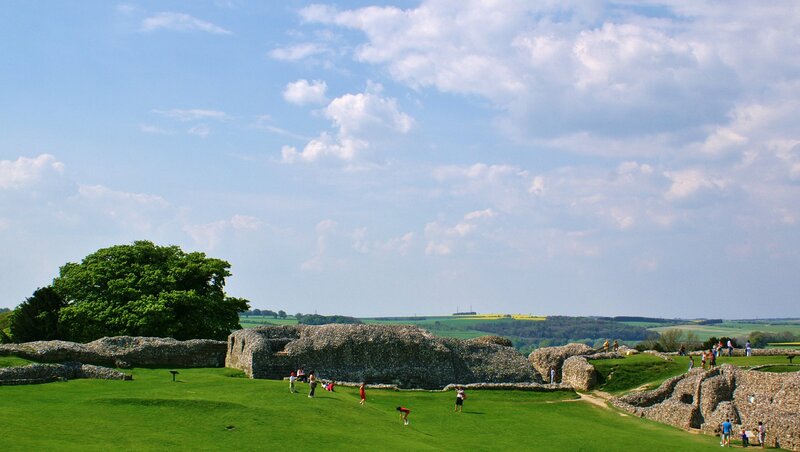 Old Sarum is an ancient motte-and-bailey fortification (ditches surrounding a built-up mound topped with walls) and was the original settlement of Salisbury. Our great(*)-grandpappy William the Conqueror built a castle atop the mount, and it was added to and inhabited until the time of King John and beyond. Aside from the main tower and walls, there was a great hall, several manor homes in the inner bailey, plus many more homes and even a cathedral in the outer bailey. But, after some centuries, since (say it with me) there is no running water on the Salisbury Plain, quarrels over water rights broke out, and the current town of Salisbury was founded down at the junction of five rivers. Water problem solved. After that, Old Sarum pretty much fell into ruin. When you walk around Old Sarum now, all you see are the inner remnants of the fortifications and foundational walls, mostly a combination of mortar and broken flint, faced with local stone. Most of the stone used for the wall facings was recycled to build the town and even the cathedral down in the new town, and while the guidebook and placards do a good job of describing and fleshing out what you’re seeing, it really wasn’t the ruins that impressed me here. It was the strategic advantage of the site, and the protection the motte-and-bailey provides. We bought a pair of Cornettos at the little shop on site, and went up and ate them under the shade of a yew tree that may very well have shaded our great(*)-grandpappy Bill. You really have to wonder, in a place like this, how many people over how many centuries have sat on this rock, taken their ease, and looked down over the plain (Cornettos notwithstanding). The mount itself is pretty high, but this is magnified by the ditches that have been dug around the perimeter, and the ramparts that have been built up with the dirt from the ditches. The wind up here just howls, a constant pressing force, even though it’s dead calm down on the plain. 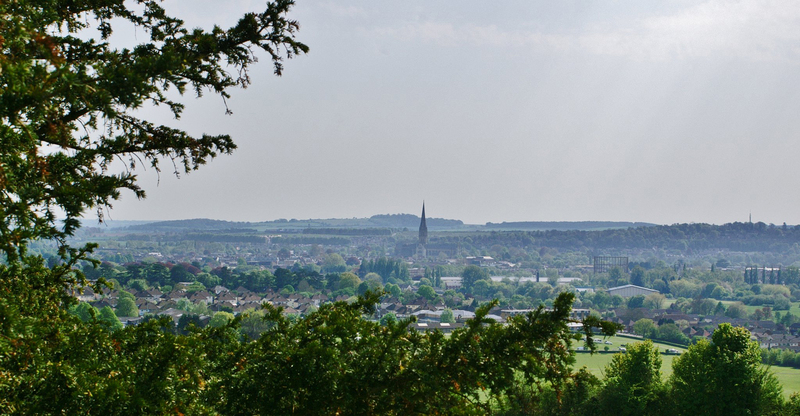 You walk around the perimeter, and you can see the town of Salisbury and the cathedral with its amazing spire down below you (the spire is actually taller than the level of Old Sarum, so you’re looking a bit upward at its tip), the wind blowing at you all the time. But when you step down from the rampart into the inner bailey, it’s dead calm again, and warm and humid. 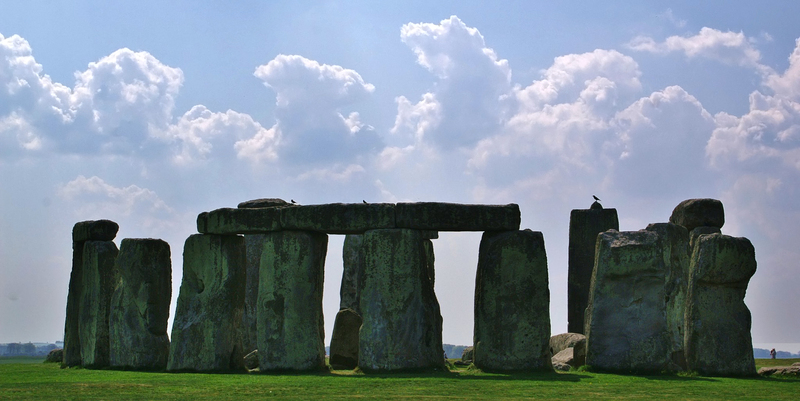 Here, unlike at Stonehenge, there is no question as to why this spot was chosen. It’s commanding without subtlety; this place is utterly defensible. We walked back down through the sheep pastures to the spot where a coach (or local bus) might pick us up, and there we met again our young Turkish (?) friend. We (i.e. my wife) struck up a conversation, and we chatted with him while we waited. He was indeed from Turkey, here studying in Portsmouth, and since he had this one day free, he was packing it full with things to do and see. If we thought our itinerary was full, this boy put everyone to shame. He had started in Portsmouth, went to Southampton, took the ferry to the Isle of Wight, went back to Southampton, took the train to Salisbury, did all the things we’d done, was going to visit the cathedral, and then would be off to London, where he was to meet up with friends for dinner and a party. Ah, to be young again, eh? Our evening was less full than his. We got back to Salisbury and went to the pub at the site of the Old Bishop’s Mill for some grub. This was obviously a hangout for the locals, which was in itself very interesting. The food was pretty good, too, and the people-watching was fascinating. It was a mix of social strata and ages, but everyone seemed to know someone else there. After dinner “the outfit” arrived, an award we give each day to the worst fashion faux-pas. This one took the day, the week, the entire trip, and was a fitting end to our outwardly bound journeys. Horizontally striped tank top, pink on mauve, with the number “14” emblazoned on the front. Dirty white bra straps peeking out from under the tank top. And she was pregnant. It was god-awful. It was fekking brilliant. After that, we went home. We had set out at 8AM and got home at 9:15PM. It was a full day, and a good one on which to end.